John Jefferson Davis summons the resources of traditional biblical meditation for a culture lost in the cloud. He establishes the trinitarian view of God's real presence in Scripture and then ushers readers through three successive stages of meditation - consummating in a method for deep assimilation of the Christian worldview. 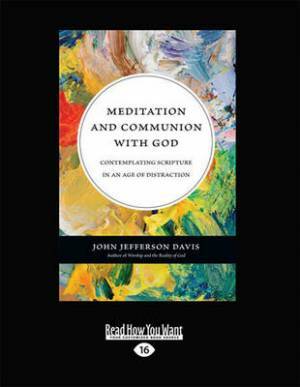 Meditation and Communion with God by John Jefferson Davis was published by ReadHowYouWant.com Ltd in November 2012. The ISBN for Meditation and Communion with God is 9781459652590. Be the first to review Meditation and Communion with God! Got a question? No problem! Just click here to ask us about Meditation and Communion with God.